There is one man whose name evokes joy and jubilation in the hearts of good people all over the universe. The name of this man is also like a thunder-bolt, a tsunami and the reason for heart failure to the kingdom of darkness of this world head quartered in Aso Rock - the Nigeria's seat of power. This man has not earned his reputation and the admiration of the people all over the world through political power, or bureaucratic placement, nor is his popularity with the people gained through any form of brutal force, military overthrow of any govt or through the activities of paid-praise-singers. Prophet Nnamdi Kanu The Great, the leader of Indigenous People of Biafra (IPOB) is that great African, although with British citizenship. Born some 49 years ago, into the family of HRM. Eze Isreal Okwu-Kanu, the present King of Afara-ukwu Ibeku, Umuahia Biafra, West Africa. Humane, honest, kind-hearted, benevolent, hardworking, an articulate planner, a man of peace, a philanthropist, and God fearing ,those who know Nnamdi Kanu may not know him by huge financial investments and swelling bank accounts especially through money stolen from political office. They may not know him by much accumulation of financial assets and landed properties especially the ones looted from government treasury while poor masses suffer hunger and poverty under his watch. Nnamdi Kanu is a man who believes in investing in people rather than investing in properties and financial asset building. Not known as a financial heavy weight or a man of financial opulence, or great investor yet, He is a man who is wealthier than the rich, and more opulent than the men with huge financial investment and swelling bank accounts. 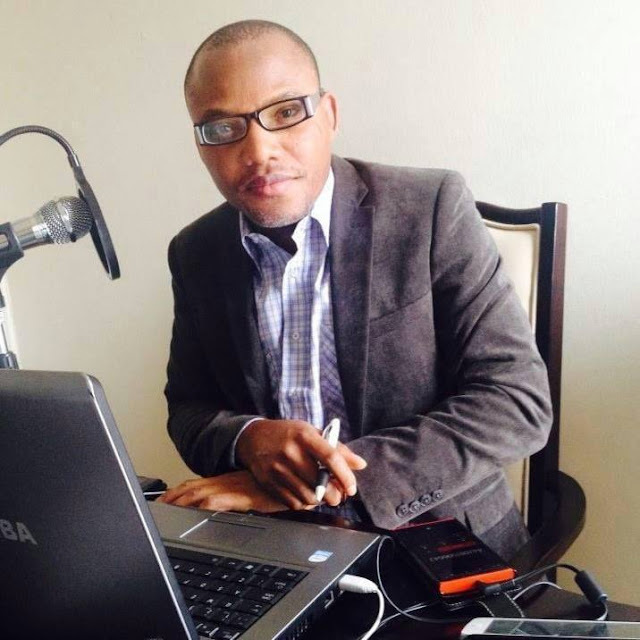 Nnamdi Kanu is a man who believes in making destiny-changing investments and impact in the lives of other men and has built great humanitarian bridges that have crossed many over from grass to grace, ignorance to intelligence, stupidity to cleverness, mental slavery to intellectual freedom, legal gullible to judicial interpreters, from people who hardly read to great articles writers. A visit to facebook posts & comments of Biafran youths will convince you. His benevolent lifestyle is evident when he built Radio Biafra/Biafra TV which he has used to preach the gospel of freedom and emancipation to all Africans who had being mentally subjected into slavery by western world. Even in Kuje prison, the iron bars did not remove his philanthropic lifestyle from him when he chose to single-handedly used his hard earned resources to organize a football competition for his fellow inmates whereas Nigerian corrupt politicians in same Kuje prison are even grudgingly using the millions of Naira they looted from govt office to hire corrupt SANs to secure their bail or defend them in their cases, Muhammadu Buhari is one of them on his certificate case saga. Nnamdi Kanu is one great African, who has from time to time, preferred to make men rather than making money. His predecessor in Biafra issues, Ralph Uwazurike had made money and left. He is a peculiar African who prefers moral investments rather than huge financial investments. No wonder He vehemently and bluntly refused to compromise even when heaven & earth was promised to him by Nigeria government to denounce Biafra, which the corrupt government later began to waste the money with MEND, Vanguard, TRIPOB and RE-IPOB. Nnamdi Kanu is the GIFT of the millennium to Biafrans, Africa and the world at large. He is a genius and the likes of him pass just once in a millennium. He has not made money, but He has made men and touched the lives of millions of people across the world positively as a philanthropist, a man of godly character, and a source of moral inspiration. Friday September 23 will vindicate me in millions of people he has touched all over the universe. I can see Nnamdi Kanu in Kuje prison saying "after my struggle of restoration of Biafra, no other part of Africa which wishes to secede will be kept under political slavery any more". O ye Africans, why not stand in solidarity with this great God given gift you as he goes to court come this Friday, September 23? Finally, his firm belief in moral rectitude, selfless service to humanity, hard work, honesty, patience, humility, as well as strong & in depth godliness has motivated Biafran youths as they are ready to die for Biafra. All Africans and black race all over the world must join Biafrans as they protest in virtually all countries in the world come friday September 23, for the release of this God given gift by Nigeria government. Make no mistake about it, all Biafrans & our supporters should stay at home in Biafraland & Nigeria.